When I was still a young seminarian at Mount Angel, I wrote a series of journal entries about why I loved St. Therese for her feast day. Read through them all or pick one to reflect on. Enjoy. Reason I love St. Therese #5: Eclairs. St. Therese enjoyed eclairs very much. Okay, so this is probably a bad place to start, but in all honesty, this is part of what draws me to St. Therese. She was holy, but she still had earthly desires. What makes her special is that she always had the proper perspective - love came first, and she new earthly desires were passing. She understood the need to find the joy in little things while living on Earth - like eclairs - but that these slight moments of joy were but a taste of heaven. "Let us see life as it really is… It is a moment between two eternities…" - St. Therese. St. Therese you were so full of joy during your earthly pilgrimage, pray that we might also live joyously. Plus, since she severely enjoyed eclairs, and sweets in general, it gives me an excuse to eat sweets on her feast day. Reason I love St. Therese #4: Her courage. Some might look at St. Therese and say “What courage? !” She was just a child. Ah, but it is in that childlike nature that her courage arises. St. Therese was only 15 when she entered the convent. Others told her not to, but she was so madly in love with God and she was so obedient to his will that she pursued it courageously. She new what she was meant to be and she did what she had to do to become a bride of Christ. When she desired to enter Carmel, she begged her father, her uncle, her bishop and she even asked the Pope when she wasn’t supposed to. She surrendered not to the world, but to God. And therein lies her courage. She was willing to suffer for God. And therein lies her courage. She desired to be a saint. And therein lies her courage. St. Therese you courageously were what God wanted you to be, pray that we might also find the courage to follow our own vocations. Reason I love St. Therese #3: Her simplicity. To most of the world, it would seem that St. Therese accomplished very little with her life. Having entered the convent at 15, it would appear that at that moment her relationship with the world ended. I disagree. I believe that in St. Therese’ simple way of offering her life to God in prayer for the world, she changed it more than any of us will never know this side of eternity. She made a difference in her little way. Nothing big, nothing spectacular, just simple sacrifices and actions, love for the greater glory of God. St. Therese, you lived the little way, help us to live simply, but love greatly. Reason I love St. Therese #2: She was instrumental in my vocation. It was World Youth Day 2005. And in the former Cathedral in Lisieux, I offered a small prayer to God, and during that prayer these words of St. Therese burned in my heart: "I have found it: My vocation is love." And it was at that moment that I realized I had to explore what true Christian love was before I could begin to discern my vocation. For the next three years I tried to grow in love and holiness. Along that way, St. Therese was such an inspiration, and in many ways I felt that she was a companion on my journey. Then in 2008 while on a personal retreat, as snow fell like it did on St. Therese’ profession day, another set of words from St. Therese entered my heart: "I fear only one thing: to keep my own will; so take it, for I choose all that You will!" Within a week I was telling friends and family I was entering the seminary. And so to this day, and everyday I try to pray that prayer. I try and abandon my will to God, and I try to choose all that God desires. 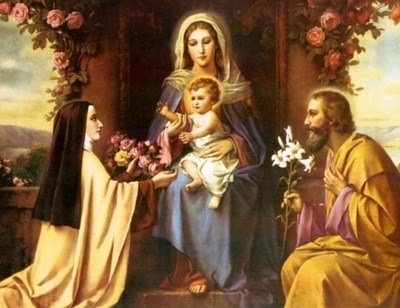 St. Therese, you discovered that your vocation is love, pray that we might also discover the vocation of love. Reason I love St. Therese #1: Her attitude toward suffering. St. Therese’ attitude toward suffering changed my life. That is not an exaggeration. And then I discovered this girl who suffered greatly for God and I was amazed. Even in her pain she was able to be joyous, and even unto death her last words were "My God I love you." St. Therese, you joyously suffered greatly for God, pray that those of us who suffer might find joy, too.